President Donald Trump will give his first speech to the U.S. Congress on Tuesday. He is expected to discuss his plan to increase military spending by nearly 10 percent, or $54 billion, offset by equal cuts in non-defense spending. The cuts will likely include large reductions in foreign aid. He told governors on Monday that he would also propose more spending on public safety, including more efforts to stop illegal immigration. And he would call for more spending to rebuild old roadways and airports and reduce taxes. Trump is likely to repeat some of the comments he made last week in a speech before conservatives. Some will watch what tone Trump uses in his speech. Will he reach out to Democrats and others who oppose his policies? Richard Vatz and Gerald Shuster are experts on presidential communication. Neither expects Trump to tone back the strong comments that have marked both his campaign for president and his first 40 days as president. “People have been predicting for a long time that he will change his tone, but it hasn’t happened and I see no reason to think it will now,” Vatz said. Vatz is a professor at Towson University in Maryland. He said the reason Trump is not likely to change is because his supporters like his strong criticism of the news media and Democrats. The downside, Vatz said, is that Trump faces the strongest opposition of any U.S. president since the 1960s. Shuster teaches at the University of Pittsburgh in Pennsylvania. Shuster does not expect Trump to moderate his language unless he faces a major setback -- such as a failure to carry out his promise to repeal and replace the health plan known as Obamacare. Presidents have been giving speeches to Congress since the beginning of the Republic. George Washington, the first president, was also the first president to give a speech to Congress. But no president since John Kennedy in 1961 has given a State of the Union address during their first year in office. 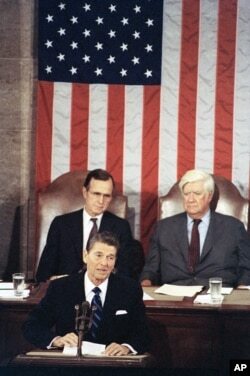 Recent presidents have instead given what is called a speech to a joint session of Congress. In his first speech to Congress in 2009, President Barack Obama said he was sure America would overcome its worst recession in over 70 years. “We will rebuild, we will recover, and the United States of America will emerge stronger than before,” Obama said. resident Barack Obama waves to First Lady Michelle Obama before 2009 speech to Congress. In 2001, President George W. Bush, a Republican, said America needed to be ready for the unexpected. A little over six months later, America faced its worst terrorist attack ever, killing 3,000 people on September 11, 2001. In 1981, new President Ronald Reagan, a Republican, discussed concerns his policies would hurt low-income Americans. He said, “All those with true need can rest assured that the social safety net of programs they depend on are exempt from any cuts." Five days after the killing of President John F. Kennedy in 1963, President Lyndon Johnson made his first speech to a joint session of Congress. He said, "All I have I would have given gladly not to be standing here today. The greatest leader of our time has been struck down by the foulest deed of our time." Who will watch Trump’s speech? Trump’s speech will be televised live across the United States and in some other nations. The audience watching in the U.S. Capitol will include more than just members of the Senate and House of Representatives. There will be members of his cabinet, Supreme Court justices and news reporters whom Trump calls the “enemy of the people” for stories critical of his administration. Members of Congress also invite “special guests” to watch the speech. House Democratic Leader Nancy Pelosi plans to invite a young immigrant who could be hurt by Trump’s plans to take on illegal immigration. Pelosi also plans to bring a person she says has spoken out about the importance of a free press. Pelosi said Trump has failed to carry out his most important campaign promise. “Five weeks into his administration, President Trump has not introduced a single jobs bill,” she said. But Trump said he is speaking for Americans who have not been treated fairly. exempt - n. not affected by some decision, rule or proposal.